YeaMe wrote: Hi All, I've been lurking about and this is such a great forum! Here's my baby; she's a 1986 Rebel 450. I took the BRC recently and the bike I rode was a Rebel 250. I really liked the bike but knew I wanted something a little bigger. I was thrilled to find a Rebel 450 in such great shape! 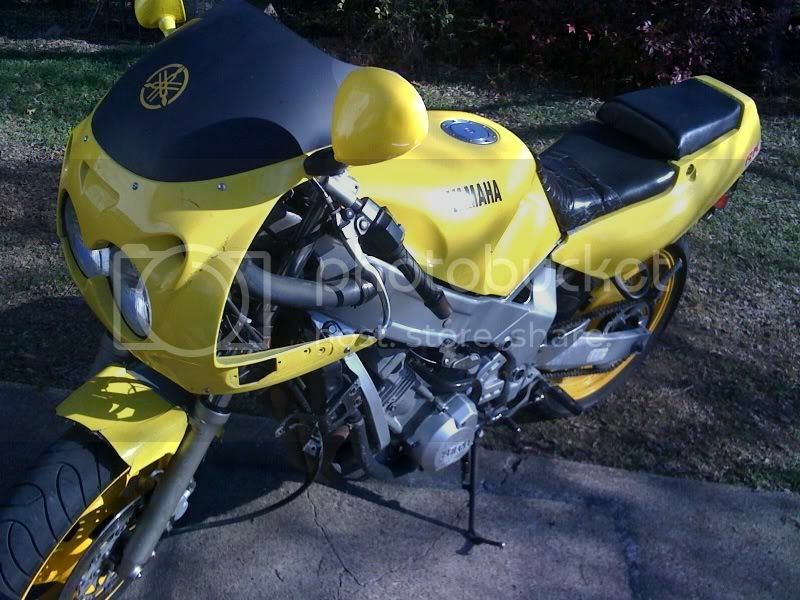 I'm already thinking of a 2nd bike, perhaps an SV650 or Ninja 650R. I, too, am very happy to let people know I got my bike first my hubby has a Shadow Aero. I wish Honda still made the Rebel in a 450. I love the Rebel as a starter bike, but (to me anyway) the 250 always felt underpowered - especially trying to get up hill in a 65 MPH zone. Nice lookin' bike you've got there! I've been riding about a year and I'm already on my third bike. 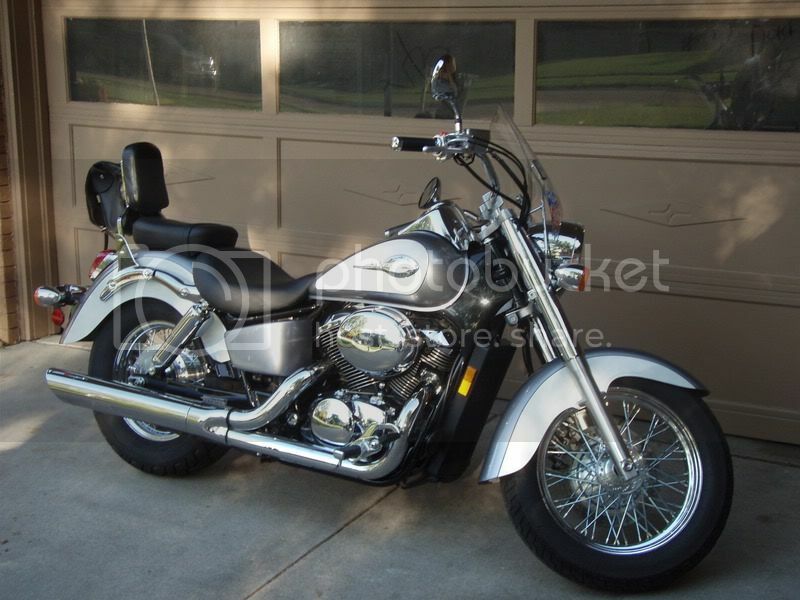 I started on a '98 Rebel 250, moved to a '95 VLX 600, and just bought my new baby - an '01 Shadow ACE 750. 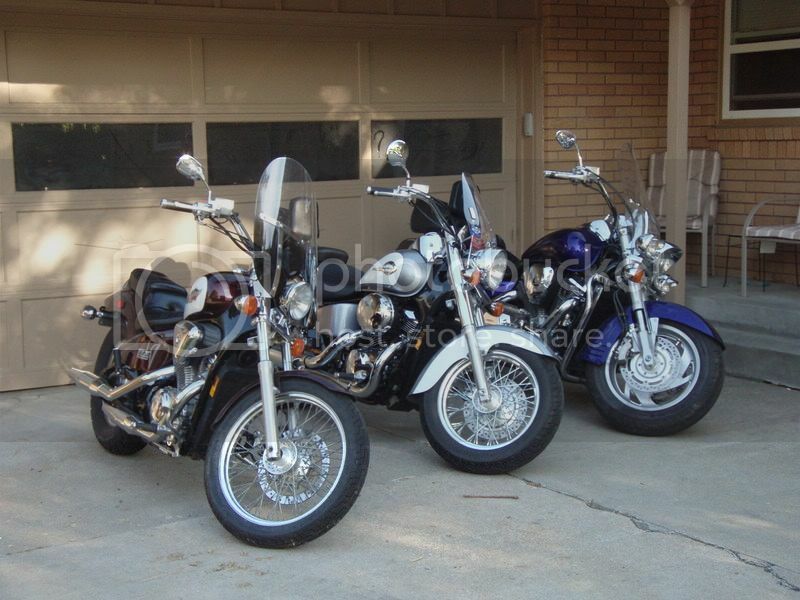 Here's the whole family - the VLX, the ACE, and my husband's VTX 1800. You have the 450 Rebel, right? That's nice lookin' bike! Just got it about a month ago I remember when I was young and used to ride, looking at these in the local motorcycle shop thinking THIS is the one. I was so lucky a guy at work just about gave it to me. I have had to put some work in in and a lot of cleanning. Stator was bad and the choke cable needed attention. Gave it the full tune up. And I plan on givin kuryakyn a paycheck or two. The shop here in town charges 100$ an hour. NO WAY thats almost a days wages. The other shop next town over had the gall to ask "what makes ya think you need THAT fuel filter little lady' OMG! He did NOT just say that! Thus I do my own work on it. Dang, these are some fine-looking bikes in this thread! Way to go with your own wrenching, too!! Gabrielle wrote: The shop here in town charges 100$ an hour. NO WAY thats almost a days wages. The other shop next town over had the gall to ask "what makes ya think you need THAT fuel filter little lady' OMG! He did NOT just say that! Thus I do my own work on it. 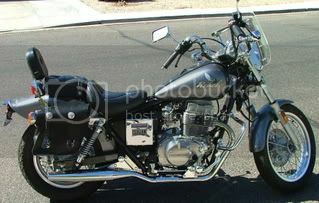 Hi all...I started out with a Suzuki GS500F and then moved on to my "dream bike," a 2004 Triumph Bonneville T100. I love it! Great handling bike with an awesome vintage look. My son loves it too...that's him on the bike in the driveway. He's 5, so it'll be a while before he's on a bike that's doing anything other than just sitting still and looking pretty!! Hi Ladies! Had to get a lil' pic up here of my ride - nothing fancy, but I love it. 2002 Kawi Meanstreak 1500. I've added a few bits and pieces to it. It's nice and stretchy for my 6' frame and just a really comfortable ride for me. Have put over 35000kms on it in the past 2.5 years. meangurl wrote: Hi Ladies! Had to get a lil' pic up here of my ride - nothing fancy, but I love it. 2002 Kawi Meanstreak 1500. I've added a few bits and pieces to it. It's nice and stretchy for my 6' frame and just a really comfortable ride for me. Have put over 35000kms on it in the past 2.5 years. Finally!! Another gal on a Mean Streak. Awesome ride, eh?! Loonette wrote: Finally!! Another gal on a Mean Streak. Awesome ride, eh?! My model (an '06) wasn't the one that came blacked out stock - I did most of it myself, in part swapping out the exhaust system with that of an '07 model. I do like a little bit of chrome, but not as much as what comes stock. I think most of my favorite people on this website live very far away from me - mostly in Canada!! But, hey, if you're ever riding around in this area, just give me a shout. Loonette wrote: My model (an '06) wasn't the one that came blacked out stock - I did most of it myself, in part swapping out the exhaust system with that of an '07 model. I do like a little bit of chrome, but not as much as what comes stock. That's right - those blacked out units came out for '08, didn't they..? So you've customized that unit alot then - very nice. And of course if we're ever scooting through OH I'll be in touch! I test rode the K1200R, and that was dangerous fast... I was humming along the highway, thinking to myself, "Why are all the cars going so sl -OOPS!- "
I'd be dead or in jail if I owned a K1200S. LOL, I upgraded to the S from a 2001 R1100RT, so you understand what i'm going through. I put 125,000 miles on the RT and i still love that bike. I kept the RT for those cross country jaunts. The S is an incredible machine, i'm scheduled to take the Lee Parks Total Control class in March. Looking forward to getting it on the track. This is my third season riding "up front". I've ridden as a passenger for over 20 years and when my son took my spot I thought it was time to get my own bike. Took the MSF course here and then started out with a V Star 650 Classic. I started riding with the boy on the back the next year and felt I needed just a bit more power for the crazy roads around here so we upgraded me to an 1100 Classic. I love it and wish I had learned to ride a long time ago. I put a nice big sissy bar bag on it (I call it my bike purse) and do pretty much every errand I can think of on it all season long (I've been known to make up errands just go go for a ride ). I realized while reading through this thread that I don't have a picture of the baby so I guess if spring ever decides to stick around here I'll have to rectify that!